Hollywood, Calif. – Delightful, delicious and hot. 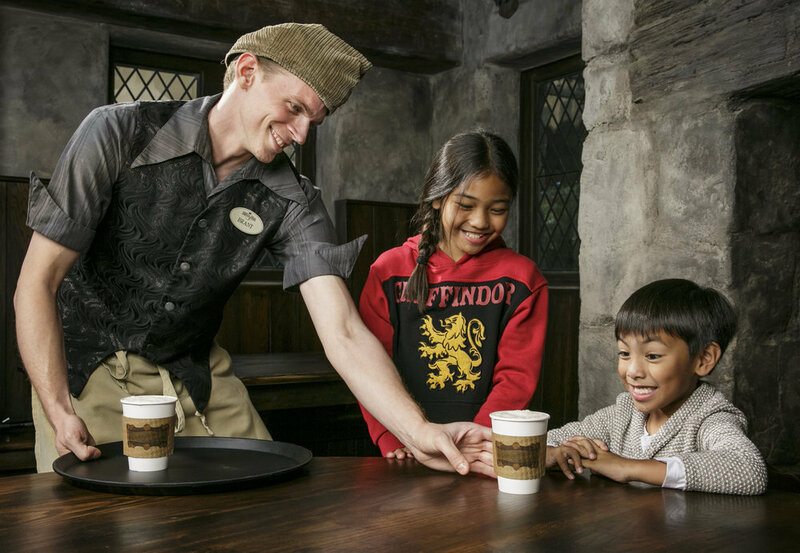 Three wonderful words that describe hot Butterbeer™, the newest addition that will be offered seasonally at Three Broomsticks™ at “The Wizarding World of Harry Potter™” at Universal Studios Hollywood™. 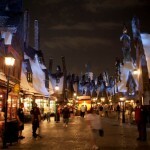 Like its traditional and frozen counterparts, hot Butterbeer is reminiscent of butterscotch and shortbread that’s been perfectly fine-tuned as a Hogsmeade treat. Three Broomsticks, an aged rustic tavern, caters to guests with an array of authentic British breakfast, lunchtime and dinner fare while they are seated at custom-made wooden tables, chairs and benches in a warm and inviting atmosphere inspired by the Harry Potter books and films. The eclectic menu offers such tasty staples as Bangers & Mash (savory grilled English sausages with creamy mashed potatoes and minted peas), Shepherd’s Pie (ground beef and vegetables, crowned with a crust of mashed potatoes), Beef Sunday Roast (prime rib of beef with Yorkshire pudding, roast potatoes and gravy), Beef, Lamb & Guinness Stew, and Fish & Chips. 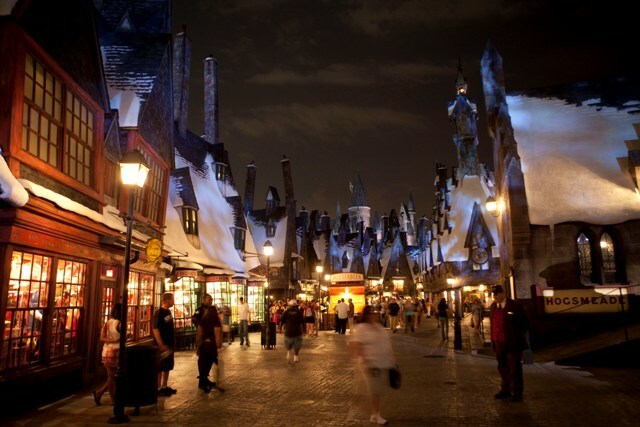 In addition to Butterbeer Potted Cream, Sticky Toffee Pudding rounds out the hearty British fare. Scrumptious traditional English breakfast items invite guests to start their day at “The Wizarding World of Harry Potter,” including the Eggy Bread breakfast (freshly baked baguette dipped in a cinnamon egg batter and lightly sautéed, sprinkled with powder sugar and served with bacon, strawberries and real maple syrup. ), as well as traditional English breakfast (fresh scrambled eggs, sausage links, bacon, baked beans, baked tomato, and potatoes) and traditional American breakfast (fresh scrambled eggs, potatoes, bacon and link sausage with butter croissant). Gathering inspiration from historic British taverns, the adjoining Hog’s Head pub features original draught beers and spirits created exclusively for the land, including Hog’s Head Brew, Dragon’s Scale, Wizard’s Brew and Fire Whiskey. Also available are Pumpkin Fizz and Gilly Water and the three Butterbeer choices: traditional, frozen and hot. 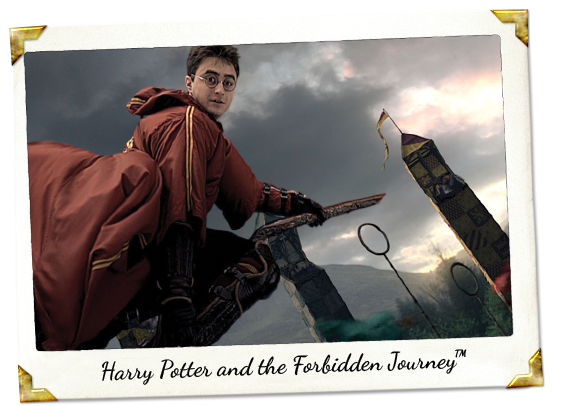 Daniel Radcliffe is set to receive his star on the Hollywood Walk of Fame on Nov 12 coinciding with the theatrical release of ‘Victor Frankenstein’ and as the 2016 spring opening of Harry Potter World at Universal Studios Hollywood nears. Hollywood, Calif. – The Hollywood Chamber of Commerce is proud to announce that Daniel Radcliffe will be honored with the 2,565th star on the Hollywood Walk of Fame on Thursday, November 12th at 11:30 a.m. PST. The star in the category of Motion Pictures will be dedicated in front of The Dolby Theatre at 6801 Hollywood Boulevard. “Fans of all ages have been waiting in anticipation of Daniel’s star ceremony. They are constantly asking when it will happen. Finally, we have him here in Hollywood, and we are proud to dedicate his star on the Hollywood Walk of Fame,” stated Ana Martinez, producer of the Hollywood Walk of Fame ceremonies. Helping emcee and Hollywood Chamber President/CEO Leron Gubler to unveil the star will be Chris Columbus and Chris Hardwick. Daniel Radcliffe was born in London, England and began his career at age nine as the young David Copperfield in the BBC/PBS presentation of the classic Charles Dickens novel. Radcliffe’s current film is the 20th Century Fox thrilling adventure “Victor Frankenstein” which will be released worldwide on November 25th. His next feature is “Now You See Me: The Second Act” in June 2016 for Lionsgate. This year he wrapped two independent films, “Swiss Army Man” and “Imperium.” He was most recently seen in the BBC telefilm “The Gamechangers.” In 2014, he starred in the horror-thriller “Horns,” and the romantic comedy “What If.” His other films include Sony Pictures Classics’ “Kill Your Darlings,” He starred last year as Billy in Martin McDonagh’s comic masterpiece “The Cripple of Inishmaan.” The play made its way to Broadway from London’s West End, where it debuted in 2013. 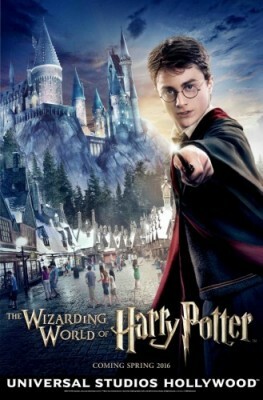 Since completing the final installment in the series of eight “Harry Potter” films in 2010, Radcliffe has become a diverse and acclaimed talent. In 2011, he starred in a ten-month sell-out run of the Broadway musical “How to Succeed in Business Without Really Trying.” In 2012, Radcliffe starred in “The Woman in Black,” which has become the most successful British horror film of all time. In 2013, Ovation aired Radcliffe’s four-part TV mini-series, “A Young Doctor’s Notebook,” a wildly original comedy drama based on a collection of short stories by celebrated Russian author Mikhail Bulgakov. Radcliffe portrayed the younger doctor, who has exchanges with his older self, played by Jon Hamm. Season two aired in 2014. In 2012, Radcliffe hosted “Saturday Night Live” and was voted “Entertainer of the Year” by Entertainment Weekly, as the most talented and original performer of 2011. He also won two Teen Choice Awards and a Scream Award, as well as two nominations for the People’s Choice Award for Favorite Movie Actor and Favorite Movie Star Under 25. Radcliffe starred as Alan Strang, in both the 2007 West End and 2008 Broadway productions of Peter Shaffer’s “Equus,” winning the award for Best Leading Actor at the Annual Theatre Fan Choice Awards, organized by Broadway World, as well as Best Leading Actor and Breakthrough Performance Awards at the Broadway.com Audience Awards. He also garnered Drama League and Drama Desk nominations for his performance in the play. The London and Broadway productions of “Equus” were directed by Thea Sharrock and also starred Richard Griffiths. Radcliffe is a spokesperson for The Trevor Project which awarded him the Trevor Hero Award. He recorded several PSAs and met with their volunteers and participated in training with the Trevor Youth Advisory Council. He is actively vocal about equality and suicide prevention in LGBT youth. Watch LIVE as the Hollywood Chamber honors Daniel Radcliffe on www.walkoffame.com. Orlando, Florida – The Wizarding World of Harry Potter at Universal Orlando Resort kicked off its grand opening celebration Wednesday with help from Harry Potter film stars Daniel Radcliffe, Rupert Grint, Tom Felton, James and Oliver Phelps, Matthew Lewis, Bonnie Wright, Michael Gambon, Warwick Davis. Fireworks explode over the Hogwarts Castle as part of the grand opening celebration at the Wizarding World of Harry Potter at Universal Orlando Resort theme park in Orlando, Fla., Wednesday, June 16, 2010. 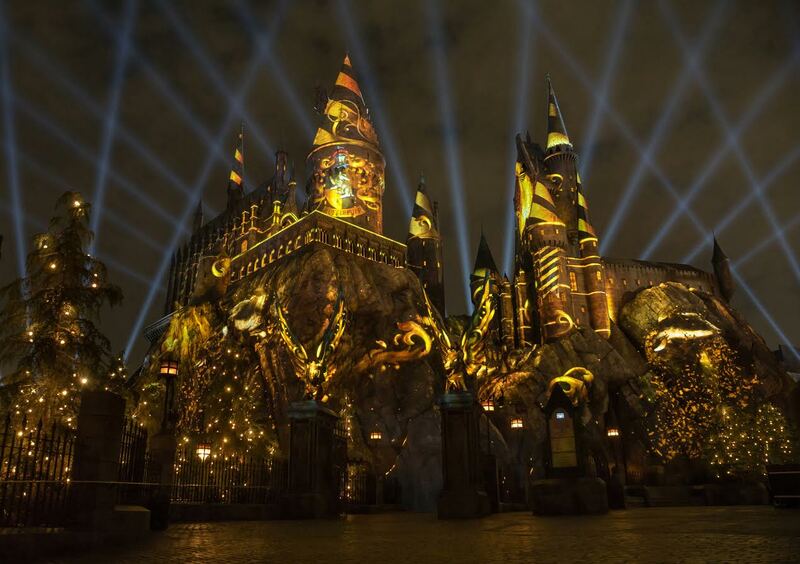 (AP Photo/John Raoux)Hundreds of people gathered in front of Hogwarts castle for a spectacular display of fireworks choreographed to a special performance of music from the Harry Potter films conducted live by renowned composer John Williams. 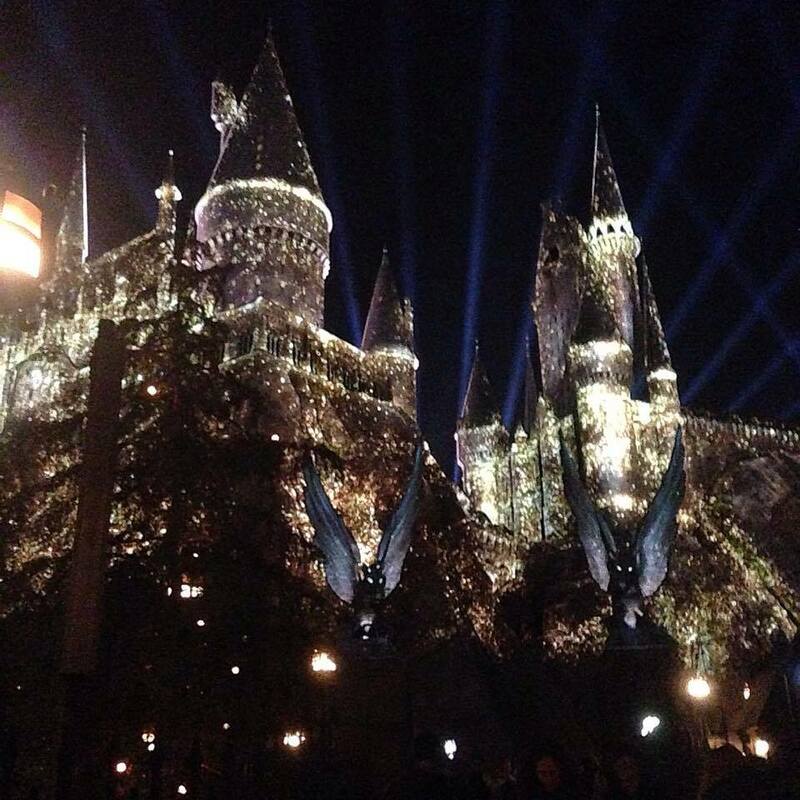 The Wizarding World of Harry Potter will officially grand open to the public Friday.